Brakes are your first line of defense against any accidents or collisions on and off the road. So it’s important that you get them checked out before they begin to fail or make noises. If you’re like most drivers in Columbus, you only get your brakes checked once you notice that something’s wrong. It’s important to get your brakes checked regularly. Note, an easy way to remember is to get them checked each time you go in for an oil or filter change at Broad & James AutoCare & Towing Not maintaining functioning brakes is a safety hazard to both you and other drivers on the road. 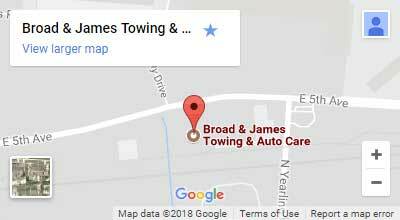 Visit Broad & James AutoCare & Towing and get your brakes checked today!